Former Premier League stars Rio Ferdinand and Robbie Savage visited a school in Gurgaon on 9 February - a day after landing in India. 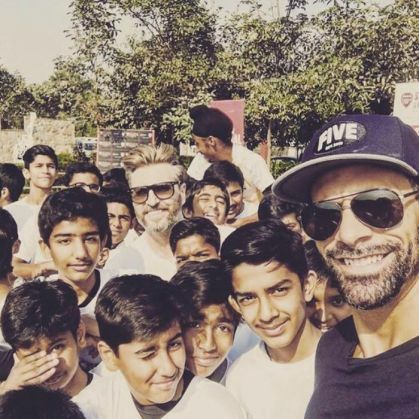 Ferdinand and Savage, who are in Delhi as part of a campaign by The Supporters Club (charitable initiative of British broadcaster BT Sport), paid a visit to the Pathways School in Gurgaon, where an Arsenal Soccer Schools centre is based. The duo met a few young footballers at the school, and held an interactive session with them. Ferdinand, a Manchester United legend, had earlier partnered up with The Supporters Club through his own charity, the Rio Ferdinand Foundation. The two ex-footballers will also be shooting a few videos for BT Sport during their India trip.